My friend Derek Ambrosino at the Hard Ball Times recently posted an article called "Who is 2013's Top Dog?" which debates which player should be drafted first in re-draft mixed leagues this season. To his eyes there are only three candidates - Miguel Cabrera, Ryan Braun and Mike Trout. I agree that those three should be candidates. However, I will add three more names for consideration - Matt Kemp, Robinson Cano and Andrew McCutchen. Kemp, Cano and McCutchen are generally going with the fourth, fifth and sixth picks in one order or another but a case can be made that they are each better selections than at least two of Derek's choices. Before jumping into each player's qualifications I think it is important to decide what is important to acquire in a first round pick, especially an early one. The first pick in the draft would ideally have a track record of success, annual statistics that typically place the player within the top 10-15 players overall, a clean bill of health, a secure position on his team and contribute to five categories. If you are lucky, that player will also be in his prime years of performance and own the potential for further upside in his statistics. Ryan Braun is at the top of Mock Draft Central's ADP Report. Braun won the 2011 MVP award and has been one of the top offensive players in baseball for years and contributes to all five offensive categories. He was worth $50 in 2012 according to BaseballHQ.com values. He has been worth at least $30 in each of the last six years and 50-plus the last two seasons. He has averaged over 600 at-bats the last five years. He is definitely in the prime of his career and signed to a long term contract by the Milwaukee Brewers. The only real negative is regarding the suspicion of PED use and the possibility of suspension. After beating the rap before the 2012 season, Braun was one of the names connected to the BioGenesis Clinic. If Braun missed 50 games due to suspension would he still have first round value? Probably, but I certainly would not be happy to have used the first pick of the draft on him. Miguel Cabrera is ranked second by MDC's ADP Report. He won the 2012 MVP Award and achieved the Triple Crown last season. Cabrera has been worth at least $30 in seven of the last eight years. HQ valued him at $42 in 2012 and at no less than $36 the last three seasons. He has batted no worse than .324 with 30 homers in each of the last four seasons. He has not had fewer than 548 at-bats since 2004. He is still just 29-years old and in the prime of his career. Last season he moved back to third base so he qualifies at a premium position. Cabrera does not steal bases and that is pretty much the only flaw in his game. If you are hunting for a problem you might knock him for some occasional issues related to alcohol but he has not had an issue with that in the last few years.The lack of stolen bases is unfortunate but Cabrera is still an excellent option. Mike Trout was the stat guy choice for the 2012 MVP. He had a Rookie-of-the-Year season better than anyone else has ever had. He hit for average, for power, scored runs, drove in runs and stole bases almost at will. BaseballHQ valued him at $49 in 2012 and $0 in his 123 at-bat audition in 2011. If Trout did everything at the same rate he did in 2012 over the entire 2013 season he would easily be the number one choice, almost without debate since he would gain more than a month of at-bats at that MVP level rate of performance. many analysts have pointed out that even with some significant regression to his 2012 statistics Trout could still be an easy first round value with an extra 100-plus at-bats added to his season totals. However, Trout, prior to the 2012 season had never displayed the 30-homer power he achieved in 2012. In fact he had never hit more than the 17 he hit at three combined levels in 2011. As Derek pointed out, it isn't unusual for a young player to show big improvement but it is not typical to make such a huge advance in a player's rookie season.Trout may be a great player in the making but one huge season does not make him an ideal first overall pick. Matt Kemp was the 2011 MVP Runner-up to Ryan Braun. He was given an astounding value of $62 by BaseballHQ in 2011 but just $24 in his injury-plagued 2012 season. Kemp began the 2012 season with a monster month of April but an early May hamstring strain (which he tried to play through) basically put him out of action until the middle of July. Kemp has been worth at least $31 in four of the last six seasons and no less than the $21 he earned in 2010. He usually contributes in all five offensive categories and is one of the rare players capable of achieving 40-plus in both homers and steals. The Dodgers have him signed for the next several years. 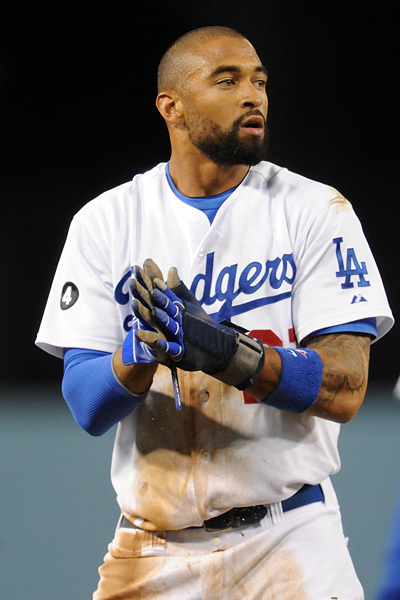 Kemp is considered a crucial part of the Dodger's core. A player coming off an injury-shortened season is not an ideal first overall pick but Kemp's upside potential is as high or higher than any of the players under consideration. Andrew McCutchen is just 26-years old but already considered one of the best in the game. He has shown power gains three years running. He has fantastic speed and has spoken publicly this spring regarding his desire to improve his base-stealing techniques.The coveted 30/30 season could be in his future.He was worth $43 according to HQ in 2012 and at least $27 in each of the last three seasons. He hasn't had fewer than 570 at-bats in the last three seasons. He contributes to all of the offensive categories. McCutchen doesn't have a long track record but in his four major league seasons has shown steady improvement while providing excellent fantasy stats. Of the players under consideration, McCutchen has the highest probability of a huge breakout season. None of the MDC drafters took McCutchen before the third pick of the draft but he is capable of delivering a season with that level of value. Robinson Cano is in the prime of his career and the best player on the New York Yankees. He is an annual MVP candidate. He has been worth at least $30 in each of the last three seasons and has done so while manning second base, a premium fantasy position. Unfortunately, he does not steal many bases. His value comes from very high batting averages and 30-homer power. Statistically he is probably a more appropriate pick for the mid to late picks of the first round but for those owners that prefer to use early picks on scarce positions Cano is a very safe option. The choice here is for Ryan Braun but as Spring Training continues and Matt Kemp proves himself healthy the decision could change.For now I believe the MDC drafters have it nearly correct. The key difference is that I would not choose Mike Trout in a re-draft league with a top five pick over the other candidates listed here.